The Magna Science Adventure Centre in Rotherham has been shortlisted for two highly prestigious CHS Awards, one for Best Unusual Event Space and one for Best Launch Event. The CHS Awards provide hotels and venues an opportunity to showcase their facilities by competing in 21 categories. Hundreds of entries are judged in two key stages by leading industry professionals and agency decision makers. The Best Unusual Event Space shortlisting is in recognition of Magna's multi-storey, multi-media and multi-purpose Face of Steel which over the past 12 months alone has played host to a car launch, numerous music concerts, exhibitions, dinners, the World's highest indoor bungee jump and a Victorian themed carousel. For the Best Launch Event shortlisting the judges were wowed by Magna's work with Kia Motors in October 2017 to launch their brand new Stonic car range to their customer facing sales team. The week-long series of events were themed around a "Revolution" within the car industry and customer engagement and used a variety of event spaces both inside and outside of the extensive Magna estate. 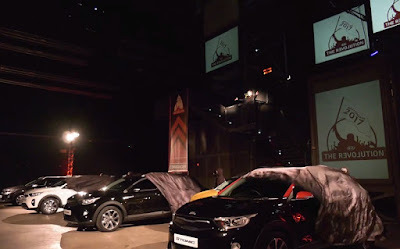 Motiv8 International, training partner for Kia Motors UK, devised a cutting-edge immersive training experience including a rousing "Campaign Speech" to the delegation beamed live via the enormous multi-media screens of the Face of Steel. In-car learning took place across the outdoor space. The winners will be announced in an awards ceremony on the May 31 at The Principal Manchester. Kevin Tomlinson, chief executive at Magna, said: "We are genuinely honoured to be shortlisted for two of the most highly regarded awards in the events and hospitality industry, judged by 70 of the best agency professionals. It is the well-earned recognition for the entire Magna team, for whom I am immensely proud." Upcoming events at the Rotherham venue include An Evening with Boxing Champion Anthony Joshua, Stranded at the Drive-in - Grease 40th Anniversary Celebration and A Night with Lucy from The Voice.